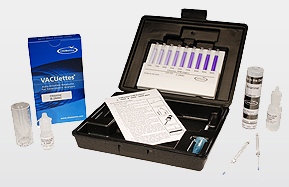 Chemetrics K-2505A free and total chlorine test kit. The kit tests free and total chlorine in the dual range 0 - 60 ppm or 60 - 300 ppm. The kit comes in a plastic case and contains everything needed to perform 30 tests (except distilled water): Refill, Low and High Range Comparators, Activator Solution, Neutralizer Solution, dilutor snapper cup, micro test tube, instructions, and MSDS.